I wouldn't call Bakemonogatari harem. 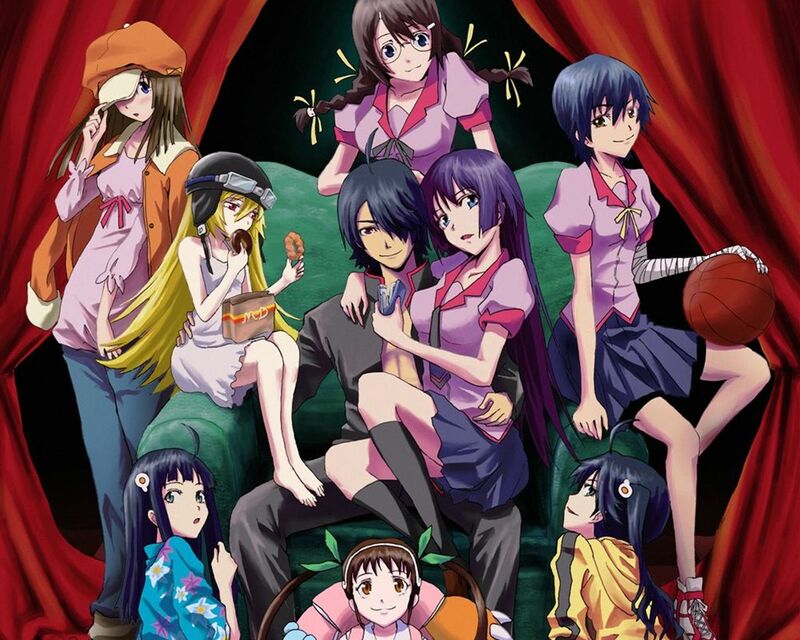 It is harem, but Bakemonogatari wrapped in more uniquely aesthetic style and animation which gives it a lot more persoanlities compared to other anime, even anime in general. Makes me wonder on how much the PSP VN sells. Is it good sells wise? It's probably ok (should have ended beyond 45k), but not awesome otherwise we would have already heard about a second episode or a port on Vita. Is that numbers usual for VN spinoffs of popular LN? The VN genre is rather niche in general. VN adaptations never sell that well. And anime adaptations in general don't sell nearly as well as they used to. It's not low at all, the game wasn't helped by the fact the original anime's run was years before too (I don't remember if Nisemonogatari was airing at the time of the release). If you want to have a better idea how much a game adaptation from an anime sell, just look at the PSP chart in 2012 , Bandai Namco released a shitton of games that year. Even a super mega hit seller like Shingeki no Kyojin (16 million manga sold in 2013) only managed a 90k opening for its first game. We have Aquamarine's data on that front. Not sure how Aqua gets those estimates for digital, but I said when she first posted it that those numbers were very unimpressive, for both ios and android. Obviously Square Enix sees potential in mobiles and is investing heavily in it. That explains it, but other stuff seems off too, GTA VC on android is between 500k - 1 million and on that german site they have it at ~386K. 1.) 3DS followed by iOS/Android ~6-12 months down the road. 2.) 3DS/iOS/Android multiplat a la what Level 5 does these days. I leaned very heavily on option 1 historically, but they are putting out a lot of Dragon Quest on iOS all the sudden, and their CEO was very "We need to make changes right now." in one of their interviews, so 2 is seeming progressively more plausible to me. 2 would make sense to me, except for the fact that they didn't put IX on ios/android, so I'm really not sure what they're gonna do with XI. Took a look in this thread. So many illusions. You should keep looking then, I already changed my prediction to 35-40k/week. According to that site Namco Bandai should probably stop making Dragon Ball phone video games. ~50k across two games on iOS and Android is horrific given they're like $4. DQ 8 still at 10.000-50.000. If i where to compare it to DQ7 on 3DS which sold 800.000+ in its first week . This does not look impressive at all . Well, keep in mind that iOS sales are missing from the Google Play statistics. It probably won't come close to DQVII's sales anyway, but DQVIII is also just a port and not a full-blown remake. You are so bad at predictions generally, still an illusion. It was delayed until 2014, so I suspect they have at least moderately high hopes for this, or they would have just put it out as is. They did actually have a Chaos Rings 1 port to Vita via PlayStation mobile IIRC, and seeing something like this show up on more platforms (as an f2p game still) doesn't seem overly implausible given Matsuda's statement about "we might port successful games over". Yeah, I'm leaning more towards Option 2 than Option 1, but I have a sneaky suspicion that DQXI might even be mobile exclusive with maybe a possible 3DS version down the line a la Puzzle and Dragons Z. This push really seems massive for iOS/Android all of a sudden and it's as though they're preparing it for the next major DQ. I'm assuming they'll do the same with Chaos Rings Sigma to either 3DS or Vita if that takes off as well. Possibly, but DQVIII is just a port as opposed to DQVII which got the full remake treatment. Of course ports of DQ remakes have put up similarly impressive numbers on handhelds like the full DQVII remake, though. Highly promoted on JP google play store and iOS store. Poorly promoted on JP google play store and iOS store. No matter what, it's really horrible. I curious to see how SE reacts since it looks like they'll be selling a lot less copies and making a lot less per sale. They're still going on with FF despite hardly blowing off the roof. The thing with their FF releases though is that the games were cheaper and the power of the brand in the west. I mainly want to see if this affects what they charge for mobile games in the future. Well, that company just doesn't learn. Yes. it is horrible , No other way to slice it . Although the question is . why is it apparently bombing this hard ? Are people in Japan aware of the bad performance of the game ? Puzzle and dragons stealing their thunder on phones ? Are these supposed to be unreasonable? I don't really get it. Madoka on the PSP did like 100k LTD. 80k seems like a ridiculously conservative estimate. For Shin Gundam Musou that's completely unrealistic, the series has been selling around 300-350k copies for each episode, why would it show a 50% increase out of nowhere ? And the Gundam's fans are more likely to wait for the release of Full Boost Extreme VS one month later which looks way better quality wise and is vastly more popular. Madoka I dunno, aside from the third movie there hasn't been anything new coming and its popularity is probably decreasing. The game is also releasing on a platform with a lower install base. Maybe they should? From my reading the website seems to be pretty good at the very least at guestimating the figures so in that case those are some awful figures right there. That makes it even worse. Wow. I love how stubborn square is. They were determined to make Lightning a popular character and now they are pushing through this mobile thing despite it not really producing much cash, it seems. Maybe one day Square will be stubborn about making FFXV...maybe. I am kinda glad after hearing all those numbers for Dragon Quest. I hope the new CEO gets a huge reality slap from these numbers and understands that re-releasing their content on iOS/Android isn't exactly a good strategy. I hope that even their original content gets rejected and bombs and flops hard. They should focus their efforts on consoles/handhelds, like they used to do. Gundam Musou is pure fantasy. I haven't searched it but I remember there isn't a single PS3/PSV release that sold more than the previous PS3 only release (and if there is it is 1 or 2 titles). Selling less is what usually happens. They just split the userbase, not expand it. Well, if we are strictly referring to musou titles, it could be that most of what we've seen this year (when they took the PS3/Vita route) are rereleases, expansions and enhanced ports. Or maybe people is tired. There are some games that has sell as good as the previous entries. Legends of Heroes and Akiba's Trip were in both PS3/V. And there is Dragon's Crown too, which is so far the best succesful VanillaWare title to date, right? There are two versions of Vice City in the Google Play store. Really? Are you just counting PS3 copies there? Gundam Musou 3 sold around 380k on PS3. So i think that they could probably hit the PS3 target of 350k? PSV target is way off. No more that 60k i think. Top one seems to be the German censored one. Oh, I definitely think that new games created for the platform will use different business models. The one thing that is handy with iOS though is it's a bit like Steam in that sales are actually effective if properly advertised, but to *really* make money on the platform you need something with a low to free entry barrier and then IAPs. All right. I know this is very late, but this was really the first opportunity I had to sit down and devote a few hours to processing, verifying, and formatting these numbers. Normally I can schedule things around it, but the holiday season has left me swamped. Besides, someone already posted the juicy stuff, so I figured there was less of a need this week for me to push myself. Ah well, everything is done, so Tsutaya + Comgnet are right on schedule for me, and next week will be fine in terms of a regular schedule. Bloodmasque is over 500k downloads, it was announce a few days ago (and it is currently free again in celebration). Maybe they only considered paid copies? I don't know how reliable that site is. I searched for info and saw some articles about www.distimo.com, also launched this year. They use both the public information xyologic/prioridata use, but also have actual sales information from the developers and publishers that use their software, using both sources to estimate sales. No free numbers from them, though. I think we have a winner for most delusional publisher goal yet shared by sinobi. Gaist Crusher ended up selling 400 copies more than I thought, good job Capcom! It's interesting how there's no presence of Danball Senki at WHF 2014, seems like another bad sign for the franchise. Not in the Corocoro section. Not at Level 5's page. Not in the general items page. Perhaps this is because the manga seems to be no longer running in Corocoro? Arkham Origins Blackgate got a release on VITA only, why no 3DS? Vita got many more third party support than the 3DS, so that's not surprising. I guess that confirms which one of Level-5's IPs dies. Yokai Watch's anime will air in the time slot currently held by Inazuma Eleven. I suppose IE goes to 7:30, while LBX goes to the bin. Which is more popular mobile platform in Japan, Android or iOS? Just impulsive curiosity while reading this thread. I'd assume Android since the Iphone is outsold by individual other phones from month to month(not every month). The Xperia was outselling the Iphone for awhile and it's just one android phone. Huh? Is this bizarro world or are you making a funny? But the Z1s release here(The U.S.) is pretty damn soon, so there's that. Versions of the game for both exist and were released in other countries. Yes, now where are the statistics pertaining to japan? It's actually closer to 30% now with some estimations expecting it to hit 70% by 2016. No wonder all them publisher chase those mobile money. I really hope PDZ gain significant success and become strong handheld IP so more publisher followed GungHo business model.